India: Baby with 2 faces seen as Hindu goddess | PinOy SPY! 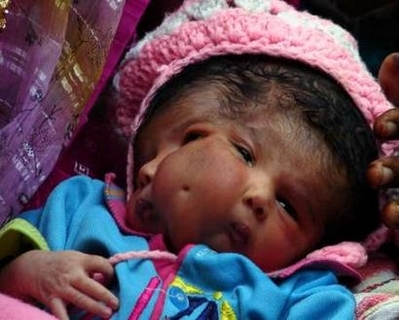 Born with an extremely rare congenital disorder called craniofacial duplication (diprosopus), in which part of the face is duplicated on the head, this month-old baby has been the center of attraction in her Saini village in Noida, some 55 km (34 miles) from New Delhi. Her family of the baby has refused special medical treatment, believing she is the incarnation of a Hindu goddess. In fact, hundreds of people have flocked to the family’s dilapidated brick house to “worship” her and seek blessings. Reports said she ate with both mouths and blinked all four eyes. Hinduism is a cool religion that is also oriented towards peace and prosperity.”`. It’s not that I want to duplicate your web page, but I really like the design. Could you tell me which style are you using? Or was it tailor made? Hello, this is actually a blogengine web site right? Can you take a look why it looks i can not get any comments accepted on your blog site? I really mean i’m having a good read in this article and I simply just try to provide a little postive feedback on your blogposts 🙂 I discovered a few helpful articles here btw.. Keep up the fantastic work! I like the valuable info you provide in your articles. I’ll bookmark your blog and check again here often. I am fairly positive I’ll learn lots of new things here!